Check your browser’s download area to download and save the file, then open it in PowerPoint. For additional details, read the documentation. If you can’t see the Export to PowerPoint button, then your tenant admin probably disabled this feature. Please contact your admin for details. In-session interactivity (highlighting and filtering, drill-down, etc.) is not supported yet when exporting. You will see the original visualizations as they were saved in the report. Custom visuals and R visuals are not supported yet. They will be exported as a blank image to PowerPoint. Reports with more than 15 pages can’t be exported. If your report contains more than 15 pages and you need to export just a bunch of the pages, save a copy of the report with only the needed pages and then export. Background images will be cropped with the chart’s bounding area. It is highly recommended to remove background images from the report before exporting to PowerPoint. 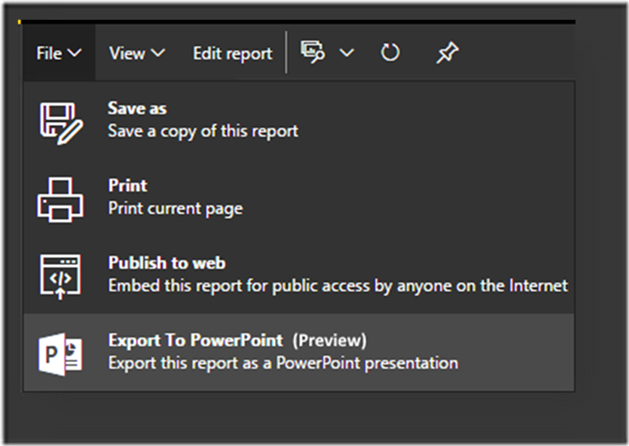 The process of exporting the report to PowerPoint might take a few minutes to complete, depends on the structure of the report and the load on the service. Please be patient and wait for completion, this feature is still in Preview.